Modellus 5 beta1 is available for download here. This version should be extremely usable. Unpack files and run Modellus5.jar through the JVM (Java 1.6 update 20 is the minimum requirement). This is the PC version, I suspect some things won’t work on Mac and Linux although I haven’t tried it yet. Modellus 5 is free. It is primarily used to aid teaching. 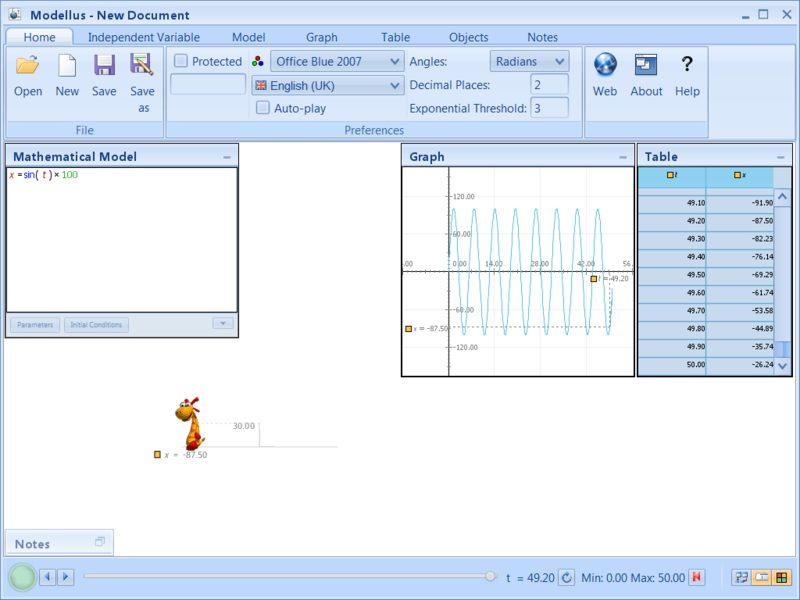 By using only a mathematical language (no need to learn any new language) students and teachers are able to create models which then they can interact/view using animations/graphs/tables, etc. From a technical standpoint, this version was created using javafx and swing. The animation window (background) was done in javafx while all the rest is Swing. I’ll be posting more information about this version, shortly. There are some examples you can try: here and here these are Modellus 4 examples though, they don’t use version 5 new features. Let me know of any bugs you encounter or feature requests. Could you help us on how do you integrate jfx and swing so nicelly. Its a real nigthmare for us. Yes, what would you want to know? I have translated Modellus 4.5 to Simplified Chinese.When do this for Modellus5.0, but found that there is no option to Simplified Chinese(简体中文 CN), Can you help me? I’ll be sending you the files that need for translation soon. Thanks a lot for your support to Modellus.